← Are you an “expert”? Does your airline train you as an expert? 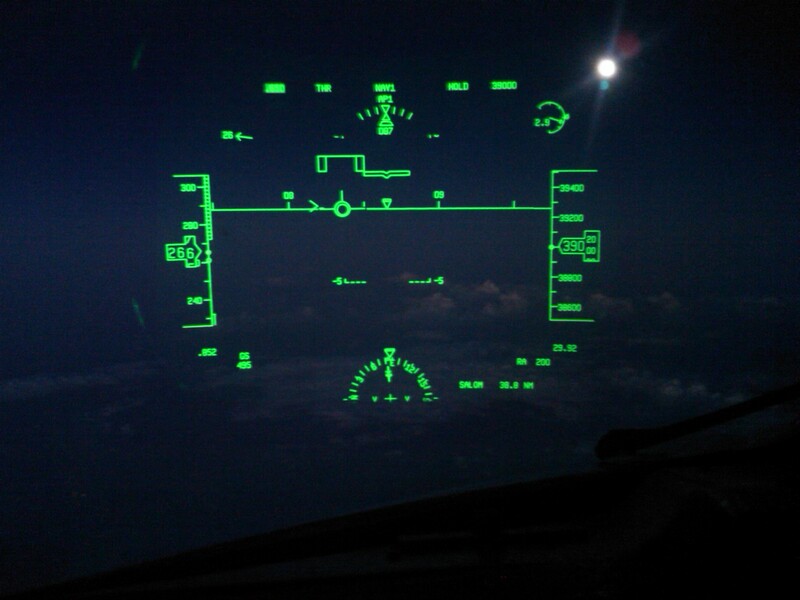 There are those that dislike using a Heads Up Display, or HUD ( such as pictured above), but in my experience, once a pilot is used to the HUD it becomes as indispensable as the Primary Flight Display (PFD), which is now the “standard” for most modern aircraft. Like the HUD, though, many might not recall that the PFD also took some get used to at first. I still remember that the first time I used a PFD (see below) I found the volume of information overwhelming. Later, even after being qualified on the aircraft (and while I was more than capable of utilizing the features needed to be safe), I was still “discovering” aspects I had not noticed before in the “information overload” when it was still new to me. Similarly, I recall a time when just having a Horizontal Situation Indicator (HSI) took some getting used to, with several instruments combined (pictured below). Like the others, the HUD becomes a “foundational” instrument, that we come to depend on. Yes, we can still fly the aircraft without it, but that is also true of the other instruments. We become accustomed to finding information in certain places, and there is information readily available on the HUD that is harder to find, or in some cases, just not available on other instruments. Obviously it can be “worked around”, but once one is used to having a certain amount of information it is never fun to give it up. An analogy might be going back to lower paying job. Sure, you could make ends meet, you did it before, but it requires readjustment. 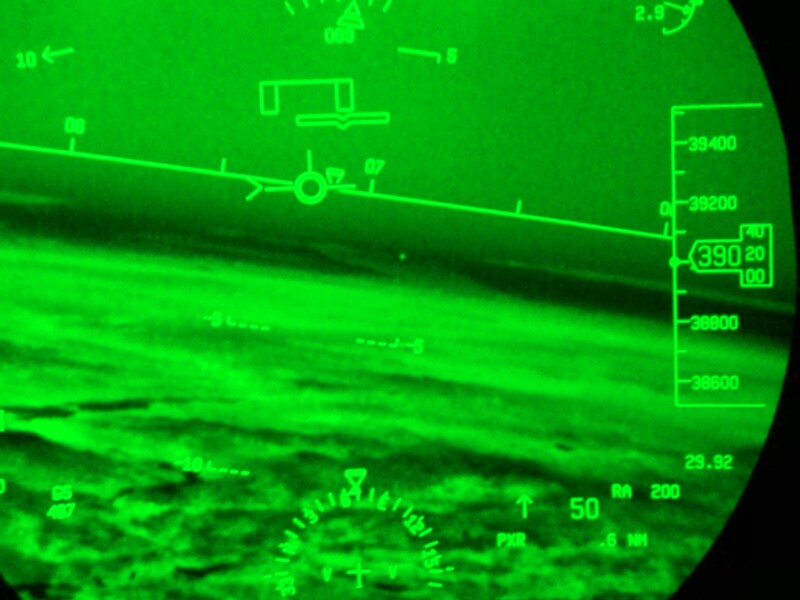 On that basis, I recently came across an aspect that is somewhat unique to the HUD where I could see it leading a pilot astray, and that is the flight director, or “guidance cue”. Flight directors can lead pilots to do the wrong things even on a standard display. The flight director is, essentially, telling the pilot how much to bank or pitch the aircraft in order to fly to the programmed course or altitude. Essentially, it is a visual portrayal of what the autopilot would do, and allows for very precise flying with the pilot retaining more control than is present if the autopilot is engaged, plus adding the capability of be able to fly into very gusty winds or with certain flight control malfunctions that the autopilot is unable to handle. By utilizing the flight director (see image below), the pilot gets the “best of both worlds”, and many pilots come to depend on it, despite the admonishment that they should “look through the flight director” and just use it to “back up” what they would do without it. 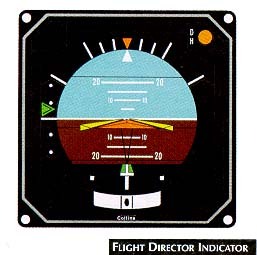 Looking through the flight director and flying the aircraft based on the attitude indicator becomes second nature with a bit of practice when utilizing a standard artificial horizon with flight director, or with a PFD. 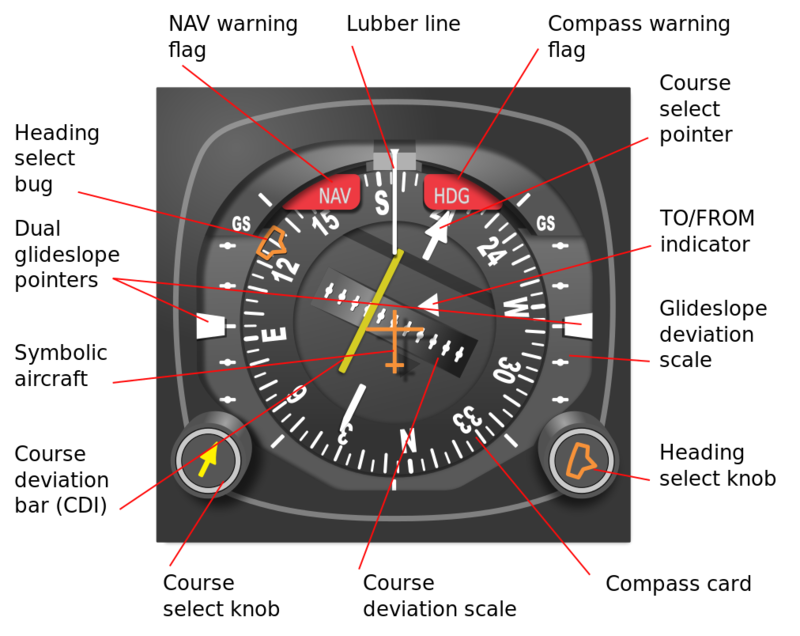 The entire attitude indicator is easy to visually “take in” with one glance. Enter the HUD. Notice that the first “tick mark” above and below the horizon is just 5 degrees. The pitch attitude is about 2.5 degrees in this image, with the “guidance cue” on the horizon. While this was in cruise flight, on takeoff there is a large gap between the actual aircraft attitude and the guidance cue. While the aircraft is pointing up fairly steeply, its climb angle is actually quite a bit less, with easily 10 degrees between them, perhaps more. The little wings symbol for the attitude symbol is up around 15-22 degrees or so, perhaps higher on some aircraft, while the guidance cue is still pointing to the actual flight path. 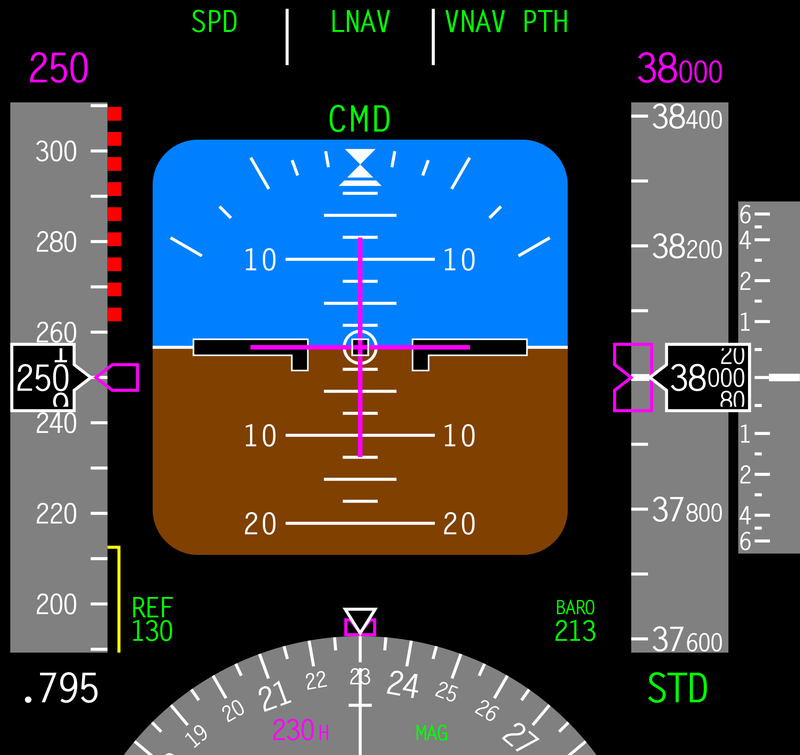 The problem is that due to the scaling, as you can see, 5 degrees is already quite a visual distance off the horizon, and 20 degrees is pretty much near the top of the scale, meaning that the pilot needs to look up near the top of the windshield, literally, to see the actual aircraft pitch attitude. Meanwhile, the flight path vector display stays at the center of the display, and the pilot is aiming to lay the flight path vector on that guidance cue, which means that the guidance cue is also probably in view at center stage of the visual field. What this does is make the flight path and guidance cue much more salient than the actual aircraft pitch attitude, with that indicator being up near the top of the visual field. That is all fine if all is working normally, but if the system were to be commanding too steep of a climb due to some anomaly it is very possible that the pilot might not see or realize just how high the pitch is getting before it is too late. This could create a critical situation in certain circumstances on approach as well. While this is a potentially dangerous situation, once a pilot is aware of this, then it is easily handled, and does not offset the safety enhancements of the HUD in my opinion. I put this out for pilots to consider, as it is a potential trap. Remember to take a peak “way up”! I agree with your remarks and observations about the HUD and wish these concerns would be more formally addressed in training. Using the HUD is great but is a fundamentally different way to fly the airplane with an even worse problem of relying on the HUD instead of the fundamental pitch and power. Specifically it is easy to fly the FPV perfectly into a tailstrike condition on landing with only a tailstrike warning which may be too late.